The Studio Montclair Incubator at Academy Square Gallery presents In Stitches, a show of works by two local artists, Randy Keenan and Catherine LeCleire. Their collections are connected through their methods of stitching artwork together to tell a larger story of expression through printmaking, assemblage, quilting and encaustic painting. Randy Keenan’s work spans a variety of media from master quilts to multi-media assemblages. Her breathtaking quilts and fiber arts are rich in color, line and texture. 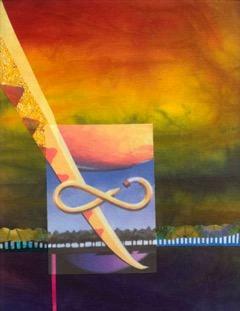 Keenan’s collages express her inner consciousness. Displaying strong colors, shapes and lines, these works have a familiar but almost unnerving quality. Her other assemblages, or mica pages, are gilded and transparent. Layered with intrinsic items and words, each one draws in the viewer for a quiet moment of study and reflection. Each work embodies a fantastical narrative waiting to be discovered. Catherine LeCleire’s works function in synergistic counterpoint with Keenan’s. Her prints and silkscreens offer a playful, yet powerful repetition of images or words. Using her innovative technique of transforming plastic bags into printable material, LeCleire stitches this material together to create large-scale quilt pieces with a unique awe-inspiring opacity. LeCleire’s encaustic works display strong colors and amazing textures with tremendous luminosity. Some of these works include silkscreened maps and writings embedded in the wax, whereas others consist of landscape compositions, minimalist in style yet rich in both color and texture. Randy Keenan graduated from the University of Massachusetts in Amherst, where she studied studio arts, exposing her to principles of composition, environmental design, landscape architecture, and art history. With a deep interest in the arts, she has attended experimental art conferences and workshops focusing on book making, collage, shibori dyeing, color, design, amongst others. She has been featured in 15 group shows, 14 juried exhibitions, and 24 publications. Catherine LeCleire was born and raised in the Philadelphia area. She attended Philadelphia College of Art (University of the Arts) and went on to graduate school at University of Southern California. While in California she taught at Otis Art Institute, California State University Dominguez Hills and California College of Arts. LeCleire is currently an Adjunct Professor at both Pratt Institute and Montclair State University; she teaches a variety of classes such as Silk Screen, Beginning Printmaking, Book Arts, Painting Processes, and Photo Printmaking. As a bookbinder, she has bound books for Bruce Connor, David Salle, Octavio Paz, Joan Mitchell, James Brown, Janet Taylor Pickett and others. Studio Montclair’s Incubator Program, directed by Lisa Diamond Rosenthal and Sara Holliday, seeks to mentor new and emerging artists and provide them with a space for what is often their first solo or small group show exhibit. Kathryn Waggener McGuire was guest mentor to Keenan and LeCleire, helping with installation, concept, and marketing advice. Studio Montclair is a nonprofit organization of exhibiting professional artists and others interested in the visual arts. Its mission is to promote culture and education in the visual arts and encourage emerging artists. Founded in 1997, the organization includes over 450 members including artists from around the United States, as well as Europe and Asia. For more information, contact smi@studiomontclair.org, or call 862-500-1447. Lisa Diamond Rosenthal is a painter and sculptor. She is also the former owner of Montclair’s Nandi School of Art, a local art hub where she employed more than 20 area artists and art teachers to support year-round classes in painting, ceramics, fiber arts, animé, and sewing. Each year, Lisa assists various non-profits by facilitating acquisitions and curating large-gallery art shows for fundraisers. She was recognized by U.S. Congressman Bill Pascrell and the New Jersey Coalition Against Sexual Assault (NJCASA) for raising significant funds for NJCASA’s crisis hotline for women through Montclair’s Rock ‘n’ Art Ball, an event she spearheaded, developed, and oversaw. A graduate of Cornell University, Lisa now owns and operates a life-and-health coaching business in Little Falls, N.J.
Sara Holliday is a practicing artist and has taught art for several years in New York. Before focusing on her teaching and art practices, she worked for a New York City graphic design and communications firm. Sara served on the Board of Directors of the International Charter School of NY, a school that serves the diverse population of Brooklyn. She also co-founded and served on the Board of Directors for The Mentoring Tree Foundation, a foundation with the mission of providing expanded educational opportunities to underprivileged and underserved youth. Sara holds a Masters in Art and Art Education from Columbia University’s Teachers College and an undergraduate degree in Arts Administration. Kathryn Waggener McGuire is owner and director of Clerestory Fine Art, a high-end art gallery in Montclair, NJ, focused on exhibiting local artists and educating area collectors. She moved to Montclair after working with special exhibitions in the Education Department of The Metropolitan Museum of Art and completing her Master’s degree in Museum Education and Historical Research at Teachers College, Columbia University. She has since written and curated extensively on American artist A.B. Jackson, and has focused on developing programs for museum audiences with Alzheimer’s and dementia, in addition to hosting the Montclair Figure Drawing Group. 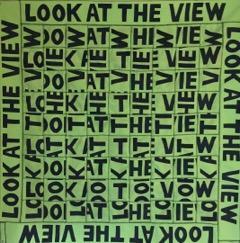 TOP IMAGE: Catherine LeCleire, Look at the View," silk screen weaving, 2016, 40" x 40"